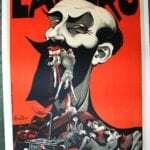 Henri Desire Landru, aka ‘Bluebeard,’ was one of France’s most notorious serial killers, who managed to make World War I an even worse affair. He’d place lonely-hearts ads in Parisian newspapers, targeting war widows, claiming an interest in marriage. Once he’d secured access to their assets, he’d murder them and burn the dismembered bodies in his oven. Between 1914 and 1919 he killed 10 women and the teenage son of one of them; he was convicted and sentenced to the guillotine in 1922. 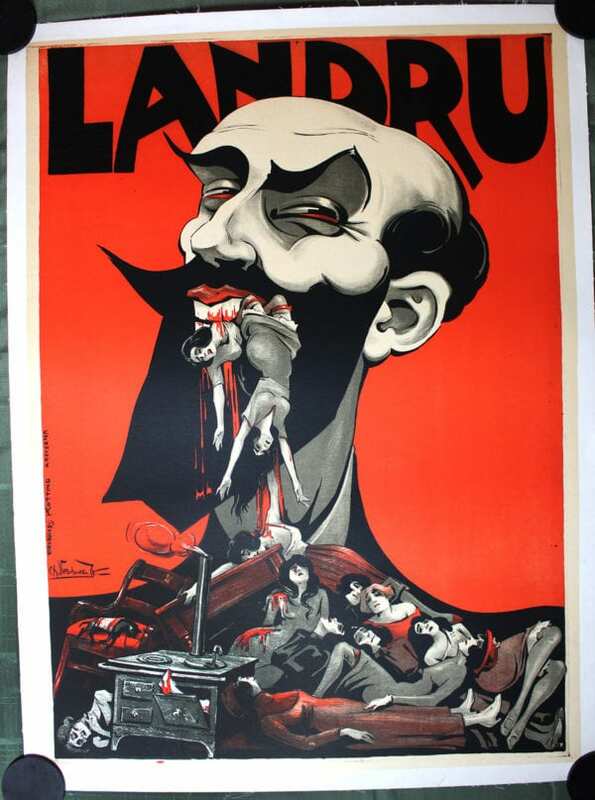 Vershuuren’s poster was designed for a Grand-Guignol-esque stage reenactment of the crimes, depicting Landru as a Saturnine figure (a la Rubens and Goya), his devouring head atop a pyramid of bodies (a la Gericault’s Raft of Medusa). The stove figures prominently in the composition.